“Why do sports and the arts have to be in completely different categories?” That was the question that a fellow classmate asked a few months ago. It seems true that arts and sports reside in opposite sides of our minds, but do they actually share similarities? The arts have notoriously struggled as a whole to bring in revenue, a skill that sports leagues have seemed to perfect. What can the arts learn from sports and its strategies? I will address this question by looking at sports broadcasting and relating how it would work with the arts. First, let’s take a look at the differences between the arts and sports. On the surface, it is obvious that the arts are performed or created while sports are played. The first organized sport, Ullamaliztli, was thought to have been created by the ancient Olmec civilization, which was formed around 1200 B.C. The arts, however, can be traced back even further. While it was previously held that the oldest paintings were around 35,000 years old, archeologists have found pigments and paint-making equipment that dates back to between 350,000 and 400,000 years old. The first record of performing arts, however—which I believe is a little more relevant to the comparison here—, was not until 2000 B.C. with the Ancient Egyptian passion plays for the king-divinity Osiris. Either way, the organized arts were around for centuries before organized sports. Another difference is in the attendance. Because of scarcity of events, sports stadiums are built to hold as many patrons as safely (and sometimes unsafely) as possible. The largest stadium in the world is the 150,000 seat Rungnado May Day Stadium in Pyongyang, North Korea, and the largest stadium in the United States is the 107,501 seat Michigan Stadium—more commonly known as “The Big House”—in Ann Arbor, Michigan. The largest non-stadium sports facility in the world is the 257,325 seat Indianapolis Motor Speedway in Indianapolis, Indiana. The arts, however, have relatively much smaller crowds. The largest performing arts specific venue in the United States is the Metropolitan Opera House in New York, NY, which seats 3,975. The scheduling is also much different between the two. A play or musical may have up to eight performances per week, while sports events are much less frequent. Racing and football, for example, typically occur once per week, and in the case of football, only from August through February. Hockey and Basketball are a little more frequent, but even then, one may only see two or three games a week. Baseball is the only truly comparable sport to the arts, having 162 games spread out over seven months. The arts do have off days, or even off weeks, but they are also usually scheduled to spread evenly throughout the entire year. One other main difference between the arts and sports is fan passion. Take a walk in downtown Washington, D.C. and you will only need about 60 seconds before you see a shirt, hat, or jacket with a Nationals, Wizards, Capitals, or Redskins logo on it. Memorabilia is worn by millions of fans everywhere. Sports fans also develop a love and a hatred for different teams, depending on location and rivalry, even to the point of fighting, as was the case in Los Angeles in April of 2011. One of the most heated rivalries in American sports is the New York Yankees – Boston Red Sox rivalry. You rarely, however, hear about subscribers of the Metropolitan Opera scuffling in an ally with subscribers of Opera Boston. There exists is a mutual respect in partaking in the arts, even if you believe your city’s organization is better than another’s. However, respect for actions is a different story. Sitting in your jeans and T-shirt while munching on a Snickers bar and popcorn at the opera will no doubt earn sharp glares from fellow patrons, but doing the same at a baseball game seems commonplace. Comfort is far more associated with sports than the arts. “Plot Highlights” is also a subject in which the two differ. Any given night, a person can turn on their television or open their newspaper, and find out what happened during the game, but that cannot work with the arts for two reasons. One is that it is impossible to share what happened in some art forms, like music, the technique of dance, and visual art, unless a writer gets as specific as to say “then the trombone played a B flat.” The second is that sharing the plot is essentially ruining the story for the next patrons. No one likes it when a friend spoils the plot to a movie or book, and the same applies in this situation. The closest equivalent to sports highlights in arts journalism is the review. But even these are too narrow, speaking mostly to an already established arts community in the know. Additionally, reviewers tend to make their living, with a few exceptions, on providing bad reviews. A person with no knowledge of an art form would not be any closer to buying a ticket after reading these reviews. One last difference is public access. Sports teams often share pictures, videos, and articles about training camps, practices, and pre-game preparations. For example, on April 26-28, the National Football League (NFL) held its annual draft, in which the top college players are drafted by the individual teams. In preparation, the NFL has a combine, attended by every team, at which players show their physical and mental skills. At the draft, on camera analysts discuss player evaluations and performances and debate which team will pick which player. The public is invited to watch this “behind the scenes” process with open access. Other leagues have similar processes. This is also very similar to auditions, in which performers show their talents as best they can and are chosen by the individual companies for their services. Auditions, however—as well as the rest of the entire production process in general—, are kept closed from the public. The only part made available to the public is the actual performance, with a rare exception of a paid preview. But even then, the “access” is not free. Companies are beginning to post casting announcements online immediately after decisions are made, but that is where the access stops. Many of these differences are intrinsic to the field and cannot be changed, but some can indeed be changed to provide a sense of access and connection for audiences. Even though there are many differences between the two, there are also many similarities. First, there is the recognition and presence of talent. In both arts and sports, there are different levels of talent, and audiences can pick up on it. Both can also be engaged in from a young age, and many times are. My childhood memories are littered with thoughts of little league baseball and soccer as well as church plays and children’s choir. Competitions are also a common theme in both the arts and sports. Obviously, sports by nature are competition, but there also exist vocal competitions, literary competitions, one-act play competitions, and show choir competitions. Even the Tony Awards and the Grammys are a form of competition. The largest similarity that strikes me, though, is that both fields are a cultural recreational activity from which people find enjoyment and are many times willing to pay for. It is these similarities that cause me to think the arts can learn from sports. In 2008 (the latest year I could find), the 32 teams in Major League Baseball (MLB) combined for a league-wide revenue of $5.8 billion, with the highest earning team, the New York Yankees, earning $375 million and the lowest earning team, the Florida Marlins, earning $139 million. Granted, that is a large difference in income. But, when your “least successful” team still makes $139 million, you are in good shape. The MLB does have a revenue sharing strategy, though, in which the most financially successful teams share extra funds with those teams that are in disadvantaged markets. Also, when expenses are calculated, the league-wide average profit is $16.7 million per team, with only two teams reporting losses. In the same year, the 32 teams in the NFL—which has been set up to reduce the differences in the “haves” and the “have-nots”—combined for a league-wide revenue of $7.6 billion, with the highest earning team, the Washington Redskins, bringing in $345 million and the lowest earning team, the Detroit Lions, earning $208 million. After expenses, the league-wide average profit is $32.3 million per team, with again only two teams reporting losses. It should be noted, though, that the two profit losing teams from the MLB are in different cities than the two profit losing teams in the NFL, so location is not necessarily the driving factor. The trend has continued to rise, as well. This last year, the league-wide revenue was up 10% from 2008 to $8.3 billion, and the average team profit was steady at $30 million net profit. The National Basketball Association (NBA) and the National Hockey League (NHL), widely considered as the third and fourth biggest sports, respectively, in the United States, also earn a large amount of revenue as a league. However, these leagues have poor business models and many teams in each league lose money every year. The largest contributing factors are unbalanced player salaries and an ever widening gap between the large market teams and the small market teams. For this reason, I do not believe it is wise to take revenue strategies from the NBA and the NHL. So, what revenue strategies can the arts learn from the MLB and the NFL? There are a few “not-so-savory” charges that some teams slap on their patrons, such as the Personal Seat License, in which the team makes a person pay a very large fee (upwards of $15,000 in some cases) for the right—and only the right, not the actual ticket—to buy a season ticket. We will stay away from these strategies and focus on those that will not cause our patrons to throw our brochures back in our faces. The biggest money making strategy that these teams and leagues use is television. Granted, these for-profit sports teams use television for profit purposes only, and not to necessarily gain audience members, still the effect of growing patronage is achieved. Once again, let’s take a look at the MLB and NFL for proof that proper use of broadcasts can grow an audience base. Another interesting note is that it seems the MLB has reached the end of the bell-curve in terms of effectiveness of television contracts on growing fan attendance. Since 2000, the national television contracts have over doubled ($3.35 billion per year), but audience attendance has only grown 8% (5,765,888 more total tickets) to a 30 team average of 2.6 million fans in 2008 (78,514,848 total). This suggests that there is a threshold of effectiveness at which the amount of money spent on broadcasting no longer efficiently boosts attendance. As I stated before, though, sports leagues do not necessarily have television contracts to boost audience attendance as much as to boost income, which could still be achieved with effective advertisement sales. Figure 1: Note: Gaps in data are due to work stoppages, strikes, or lack of data. Similar results continue throughout the decades , but in an attempt to keep this from becoming too dense, I will skip forward to the 1998 national television contract changes. 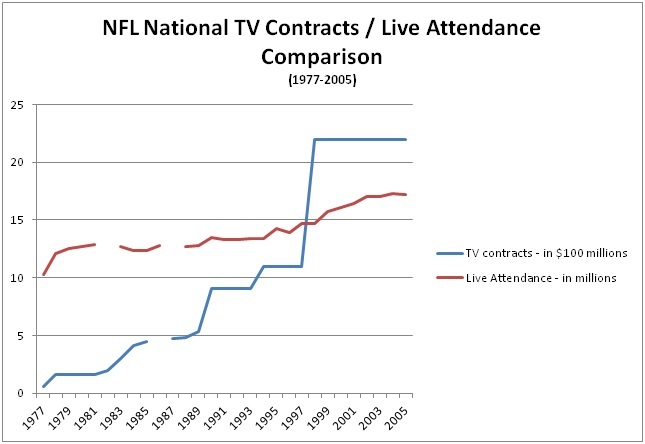 In 1997, the NFL reached all time highs in contracts and attendance, with an annual television contract total of $1.1 billion and a 30 team average attendance of 488,472. In 1998, contracts were increased to $2.2 billion per year until 2005. The results of this change are astounding. By 2005, the yearly attendance for the entire league had grown by 2.54 million fans, and the 2005 32 team average yearly attendance was 537,510. The important point to remember is that in game income is not only earned at the gate. Fans also purchase food, drinks, memorabilia, programs, and other in stadium items. In 2005, the NFL fan cost index, which includes all items a fan might purchase at a game, the ticket (average of all ticket levels), fees, and parking, come out to a league average of $329.82 per fan, and had reached $396.36 per fan by 2008. Again, I will reiterate the point that the television contracts for each league were designed with commercial advertisement revenue in mind, and not necessarily with fan attendance in mind, but the effect of growing audience bases was achieved through increased television exposure. I have two theories, which are interconnected, for why this happened. (Unfortunately, they will remain theories, because the only way to prove them would be to individually survey each fan to find out why they attended games). One theory is that national exposure allows the fans to see the superstars from the other teams. For example in 1998, only three years after the strike that alienated a multitude of fans, the season that included the infamous Sammy Sosa-Mark McGwire home run race was dubbed “the season that saved baseball.” The national exposure allowed baseball fans from across the nation to forget their anger and tune in every day to see if either player, or both, could break Roger Maris’s home run record. I remember turning on the news or ESPN every evening to see what the next chapter in the Sosa-McGwire race held. My high school friends would brag that they got tickets to the games when either of the two stars’ teams (McGwire – St. Louis Cardinals, Sosa – Chicago Cubs) made their way to Atlanta. It created a frenzy, even among fans from other teams. By the end of 1998, McGwire had belted 70 home runs—easily braking Maris’s mark of 61—,Sosa had smacked 66, and fans were again excited to attend baseball games. Another example is Peyton Manning and Tom Brady in the NFL. These superstars, and especially the rivalry between them, transcended the game and created a buzz throughout the sport. Much like McGwire and Sosa, these individuals attracted many fans who simply wanted to see legends play live. The second interconnected theory is that the exposure leads to a tighter connection with fans. When a fan watches their team play every week, or every day in MLB’s case, they begin to form a sort of virtual relationship with the players and coaches. I refer to my own experience with this theory. In 1995, the Atlanta Braves baseball team brought up a young, talented rookie by the name of Larry “Chipper” Jones to play third base. That year, he won the hearts of many Braves’ fans by hitting 23 home runs and contributing to a World Series title. 19 years later, Jones has broken many Braves records, established himself as one of the greatest switch hitters to ever play, and solidified himself as a lock for the Baseball Hall of Fame. I, however, have not lived in Georgia since 2005, but in my travels, I have been able to continue to watch Jones play because of national coverage. And since this is his final year, I will be sure to purchase a ticket to a Washington Nationals game whenever the Braves come to town. If sports teams and leagues can boost attendance by increasing national broadcasting and using stars to increase the brand image, it seems obvious that the arts can do the same. Arts organizations already use names to sell tickets, such as Brian Stokes Mitchell at Strathmore and Constantine Maroulis at the Kennedy Center, but very rarely are these names paired with a national broadcast. There are a few organizations across the world, such as the Metropolitan Opera, The National Theatre in London, the Bolshoi Ballet, and the Los Angeles Philharmonic, that have begun to broadcast their performances live in certain venues. The Metropolitan Opera pioneered the use of live broadcasts into movie theaters, and we will focus on their numbers since this program was initiated to see if the strategy is effective. In 2000, the Metropolitan Opera was booming, with performances selling at 93% capacity. But as the decade progressed, box office sales began to slow, and by 2006, sales had dropped to 79% capacity. It should be noted that box office income had actually risen by 2006, but that was because the Met raised ticket prices, leading to a false sense of growth. That year, the company began an innovative new program called Live in HD, in which selected performances were simulcast into a number of movie theaters for a paying audience to enjoy live, but at much cheaper prices than attending the Met. Met Opera stars served as hosts, and audiences got a unique view of the performances. That year, the Met offered 6 transmissions to 248 movie theaters in 8 countries, and the total attendance reached 325,000 (see figure 3). The next season, 8 transmissions were broadcast to 632 theaters in 19 countries, and attendance rose to 935,000. Over the next few years, the program grew in number of transmission as well as the number of theaters broadcast to, and by the end of the 2010-2011 season, the Live in HD series had 12 transmissions to 1,500 theaters in 47 countries, attracting over 2.6 million viewers. Just to put that into perspective, approximately 800,000 people attended performances in the Metropolitan Opera House that season. This year is looking even more successful. This season’s October transmission of Don Giovanni reached 216,000 people worldwide in one broadcast, and 50,000 more in delayed showings in Asia, Australia, New Zealand and South Africa, and in “encore” broadcasts in North America and Europe. Once again for perspective, the entire run of the opera at the Metropolitan Opera House, if completely sold out, would only reach a total audience of 68,000. This year, the Met will reach 1,700 theaters in 54 countries with 11 transmissions, and current attendance estimates show that attendance will reach approximately 2.95 million people. Just recently, the Live in HD program sold its 10 millionth ticket, making a strong statement that broadcasting the arts can be a successful venture. The interesting thing about the Live in HD series is that it provides a unique experience for the audience. You can attend a performance in the opera house, and experience the amazing booming voices and orchestra, marvel at the sets, and get caught up in the emotion of the opera. Or, you can attend a transmission in a movie theatre and experience amazing cinematography and high definition close-ups of the action, all the while slouching in your jeans and t-shirt while munching on popcorn, and still experiencing the “flow” of the opera. Neither one detracts from the other because neither one can provide what the other gives. It is exactly like attending a sporting event. You can sit at home in front of your big screen television and watch high definition coverage of the action with close-ups, graphics, and commentators, or you can attend the live event and experience the thrill and emotion of live sports. The experiences are so different. The prevailing thought in the market is that when you offer a less expensive alternative to your current product, people will leave the more expensive one for that less expensive one. That has not been the case with the Live in HD performances, however. In fact the reverse is true. Since the start of the Live in HD program in 2006, in house attendance at the Metropolitan Opera has grown each year, and as of 2009, had risen to 88% capacity. (see figure 4). The same effect can also be seen throughout the entire opera community in the United States. A 2008 Schugoll Research analysis showed that almost one-quarter (23%) of Live in HD attendees had never seen opera before, even in their own local area. Also, 30% of participants who had not attended opera in the last 2 years, including those who had never been and those who had, but not recently, and 75% of all participants, regardless of amount of attendance, stated that they were “very likely” to attend opera in the future. This suggests that even though the Live in HD prices are much cheaper than live opera, the transmissions do not deter live attendance, and in fact they seem to reinvigorate people’s love for the art form. More recent data also confirms this. The National Endowment for the Arts reports that from 1982 – 2008, attendance for opera, as well as many other art forms, had been in a steady decline. Opera America confirms this by stating that opera attendance in 2002 was 6.6 million, but attendance had fallen to 4.8 million by the end of 2008. However, right along the same timeline as the growth of Live in HD, Opera America reported that opera attendance in the 2009-2010 season had grown again to 6.7 million people. These statistics suggest that the relatively inexpensive access that the Live in HD series provides the public serves as a catalyst for a “trickle-down effect” to other local opera organizations. People attend a Live in HD transmission, become excited about opera again or for the first time, and in turn patronize their local opera organization. A win-win for all. It seems that, while sports and arts occupy very different spaces in the minds of many of the American public, the arts would be smart to follow the lead of the MLB and NFL. By making proper use of broadcast technology, entities can grow their audience base as well as the audience base for their art form in general. Other larger organizations are beginning to follow suit in slightly altered versions, like the Dallas Opera’s April 28th simulcast of The Magic Flute in Cowboys Stadium. I believe that the same effect can be achieved in dance and theatre as well. The interesting question is whether small to midsize organizations can achieve the same results with this strategy, or if it is reserved for those organizations that have a name reputation. Since I could find no record of smaller organizations attempting a simulcast, that question will have to be answered by the first one brave enough to dive in. But as in all research and strategy, the only way to map uncharted territory is to take a breath and enter it. “Aztec Ball Game,” Aztec-History.com, accessed April 24, 2012, http://www.aztec-history.com/aztec-ball-game.html. “Olmec,” Oracle ThinkQuest Education Foundation, accessed April 24, 2012, http://library.thinkquest.org/18778/olmec.htm. “Earliest Evidence of Art Found,” BBC News, May 2, 2000, http://news.bbc.co.uk/2/hi/science/nature/733747.stm. “Egyptian ‘Passion’ Plays,” Theatre History.com, accessed April 24, 2012, http://www.theatrehistory.com/origins/egypt001.html. “The World’s Largest Sporting Venues,” Stadium Atlas, accessed April 25, 2012, http://www.stadiumatlas.com/the-worlds-largest-sporting-venues/. “FAQ’s: The Opera House,” The Metropolitan Opera, accessed April 25, 2012, http://www.metoperafamily.org/metopera/about/aboutus_template.aspx?id=10046. Jaxon Van Derbeken, “Giants Fan Critically Beaten by Dodgers Fans,” San Francisco Chronicle, April 2, 2011, http://www.sfgate.com/cgi-bin/article.cgi?f=/c/a/2011/04/01/BAM31IONA2.DTL. “2012 Draft,” NFL.com, accessed April 25, 2012, http://www.nfl.com/draft/2012. “Major League Baseball Income and Expenses, 2008,” Rodney Fort’s Sports Business Data Pages, accessed April 19, 2012, http://www.rodneyfort.com/SportsData/BizFrame.htm. “National Football League Income and Expenses, 2008,” Rodney Fort’s Sports Business Data Pages, accessed April 19, 2012, http://www.rodneyfort.com/SportsData/BizFrame.htm. “NFL Team Values, The Business of Football,” Forbes, accessed April 21, 2012, http://www.forbes.com/lists/2011/30/nfl-valuations-11_rank.html. Ailene Voisin, “Voisen: NBA Must Fix Broken Business Model,” ScrippsNews, July 1, 2011, http://scrippsnews.com/content/voisin-nba-must-fix-broken-business-model. Kevin Maney, “Amid Cancelled Season, NHL Faces Financial Meltdown,” USA Today, March 20, 2005, http://www.usatoday.com/sports/hockey/nhl/2005-03-20-nhl-financial-trouble_x.htm. “Major League Baseball Attendance, 1890-2009,” Rodney Fort’s Sports Business Data Pages, accessed April 19, 2012, http://www.rodneyfort.com/SportsData/BizFrame.htm. “Major League Baseball TV Revenues, MLB’s National TV Contracts,” Rodney Fort’s Sports Business Data Pages, accessed April 20, 2012, http://www.rodneyfort.com/SportsData/BizFrame.htm. Associated Press, “1994 Strike was a Low Point for Baseball,” ESPN.com, updated August 10, 2004, http://sports.espn.go.com/mlb/news/story?id=1856626. Ken Rappaport, “The AFL – NFL Merger was Almost Booted…by a Kicker,” NFL.com, accessed April, 26, 2012, http://www.nfl.com/news/story?id=09000d5d81206b90&template=without-video-with-comments&confirm=true . “National Football League Attendance, All Teams All Years,” Rodney Fort’s Sports Business Data Pages, accessed April 20, 2012, http://www.rodneyfort.com/SportsData/BizFrame.htm. “National Football League TV Revenues, 1960-2013,” Rodney Fort’s Sports Business Data Pages, accessed April 20, 2012, http://www.rodneyfort.com/SportsData/BizFrame.htm. “National Football League Fan Cost Index, 1991-2008,” Rodney Fort’s Sports Business Data Pages, accessed April 22, 2012, http://www.rodneyfort.com/SportsData/BizFrame.htm. Joel Roza, “McGwire, Sosa, Bonds, and MLB Steroid Generation – Saviors, Villains, or Both?”, Caller.com, April 11, 2011, http://www.caller.com/news/2011/apr/11/mcgwire-sosa-bonds-and-mlb-steroid-generation-savi/?print=1. “Events & Tickets – Calendar,” Strathmore, accessed April 26, 2012, http://www.strathmore.org/eventstickets/calendar/view.asp?id=7193. “Jekyll & Hyde,” The Kennedy Center, accessed May 3,2012, http://www.kennedy-center.org/events/?event=TNTSH. Zachary Woolfe, “I’m Ready for my Close-up, Mr. Puccini,” New York Times, April 27, 2012, http://www.nytimes.com/2012/04/29/arts/music/the-mets-hd-broadcasts-are-changing-opera.html?_r=3&pagewanted=1&emc=eta1. The Metropolitan Opera, “Annual Reports 2007-08 and 2008-09,” accessed April 28, 2012, 26. Lee Abrahamian, The Met: Live in HD Press/Fact Sheet, updated April 25, 2012, 3. Abrahamian, The Met: Live in HD Press/Fact Sheet, 3. The Metropolitan Opera, “Annual Reports 2007-08 and 2008-09,” 26. Schugoll Research, “The Metropolitan Opera Live in HD: Who Attends and Why?”, Opera America, Fall 2008, 43, http://www.operaamerica.org/content/research/Met%20HD%20Article.pdf. Sally Gifford, “National Endowment for the Arts Announces Highlights from 2008 Survey of Public Participation in the Arts,” National Endowment for the Arts, June 15, 2009, http://www.nea.gov/news/news09/SPPA-highlights.html. “Quick Opera Facts 2007,” Opera America, accessed May 1, 2012, http://www.operaamerica.org/content/research/quick.aspx. “Quick Opera Facts 2008-2009,” Opera America, accessed May 1, 2012, http://www.operaamerica.org/content/research/quick0809.aspx. “Quick Opera Facts 2010-2011,” Opera America, accessed May 1, 2012, http://www.operaamerica.org/content/research/quick1011.aspx. “Dallas Opera Breaks World Record For Simulcast by the Dallas Foundation,” Broadway World.com, Dallas, April 18, 2012, http://dallas.broadwayworld.com/article/Dallas-Opera-Breaks-World-Record-For-Simulcast-by-the-Dallas-Foundation-20120418. “2012 Draft.” NFL.com. accessed April 25, 2012. http://www.nfl.com/draft/2012. Abrahamian, Lee. The Met: Live in HD Press/Fact Sheet. updated April 25, 2012. 3. Associated Press. “1994 Strike was a Low Point for Baseball.” ESPN.com. updated August 10, 2004. http://sports.espn.go.com/mlb/news/story?id=1856626. “Aztec Ball Game.” Aztec-History.com. accessed April 24, 2012. http://www.aztec- history.com/aztec-ball-game.html. “Dallas Opera Breaks World Record For Simulcast by the Dallas Foundation.” Broadway World.com, Dallas. April 18, 2012. http://dallas.broadwayworld.com/article/Dallas-Opera-Breaks-World-Record-For-Simulcast-by-the-Dallas-Foundation-20120418. “Earliest Evidence of Art Found.” BBC News. May 2, 2000. http://news.bbc.co.uk/2/hi/science/nature/733747.stm. “Egyptian ‘Passion’ Plays.” Theatre History.com. accessed April 24, 2012. http://www.theatrehistory.com/origins/egypt001.html. “Events & Tickets – Calendar.” Strathmore. accessed April 26, 2012. http://www.strathmore.org/eventstickets/calendar/view.asp?id=7193. “FAQ’s: The Opera House.” The Metropolitan Opera. accessed April 25, 2012. http://www.metoperafamily.org/metopera/about/aboutus_template.aspx?id=10046. Gifford, Sally. “National Endowment for the Arts Announces Highlights from 2008 Survey of Public Participation in the Arts.” National Endowment for the Arts. June 15, 2009. http://www.nea.gov/news/news09/SPPA-highlights.html. “Major League Baseball Attendance, 1890-2009.” Rodney Fort’s Sports Business Data Pages. accessed April 19, 2012. http://www.rodneyfort.com/SportsData/BizFrame.htm. “Major League Baseball Income and Expenses, 2008.” Rodney Fort’s Sports Business Data Pages. accessed April 19, 2012. http://www.rodneyfort.com/SportsData/BizFrame.htm. 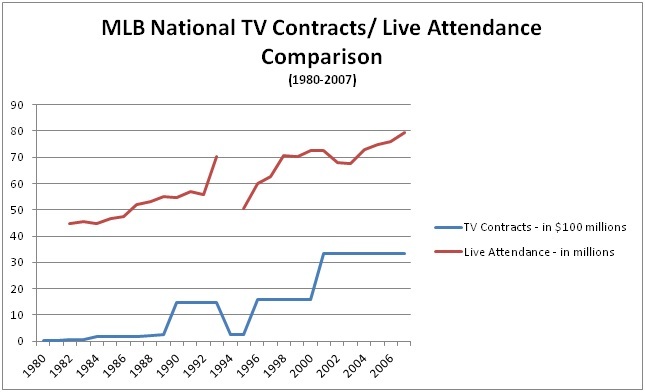 “Major League Baseball TV Revenues, MLB’s National TV Contracts.” Rodney Fort’s Sports Business Data Pages. accessed April 20, 2012. http://www.rodneyfort.com/SportsData/BizFrame.htm. Maney, Kevin. “Amid Cancelled Season, NHL Faces Financial Meltdown.” USA Today. March 20, 2005. http://www.usatoday.com/sports/hockey/nhl/2005-03-20-nhl-financial-trouble_x.htm. The Metropolitan Opera. “Annual Reports 2007-08 and 2008-09.” accessed April 28, 2012. 26. “National Football League Attendance, All Teams All Years.” Rodney Fort’s Sports Business Data Pages. accessed April 20, 2012. http://www.rodneyfort.com/SportsData/BizFrame.htm. “National Football League Fan Cost Index, 1991-2008.” Rodney Fort’s Sports Business Data Pages. accessed April 22, 2012. http://www.rodneyfort.com/SportsData/BizFrame.htm. “National Football League Income and Expenses, 2008.” Rodney Fort’s Sports Business Data Pages. accessed April 19, 2012. http://www.rodneyfort.com/SportsData/BizFrame.htm. “National Football League TV Revenues, 1960-2013.” Rodney Fort’s Sports Business Data Pages. accessed April 20, 2012. http://www.rodneyfort.com/SportsData/BizFrame.htm. “NFL Team Values, The Business of Football.” Forbes. accessed April 21, 2012. http://www.forbes.com/lists/2011/30/nfl-valuations-11_rank.html. “Olmec.” Oracle ThinkQuest Education Foundation. accessed April 24, 2012. http://library.thinkquest.org/18778/olmec.htm. “Quick Opera Facts 2007.” Opera America. accessed May 1, 2012. http://www.operaamerica.org/content/research/quick.aspx. “Quick Opera Facts 2008-2009.” Opera America. accessed May 1, 2012. http://www.operaamerica.org/content/research/quick0809.aspx. “Quick Opera Facts 2010-2011.” Opera America. accessed May 1, 2012. http://www.operaamerica.org/content/research/quick1011.aspx. Rappaport, Ken. “The AFL – NFL Merger was Almost Booted…by a Kicker.” NFL.com. accessed April 26, 2012. http://www.nfl.com/news/story?id=09000d5d81206b90&template=without-video-with-comments&confirm=true. Roza, Joel. “McGwire, Sosa, Bonds, and MLB Steroid Generation – Saviors, Villains, or Both?”. Caller.com. April 11, 2011. http://www.caller.com/news/2011/apr/11/mcgwire-sosa-bonds-and-mlb-steroid-generation-savi/?print=1. Schugoll Research. “The Metropolitan Opera Live in HD: Who Attends and Why?”. Opera America. Fall 2008. 43. http://www.operaamerica.org/content/research/Met%20HD%20Article.pdf. Teicholz, Tom. “Culture with a Side of Popcorn.” Huffington Post. April 20, 2012. http://www.huffingtonpost.com/tom-teicholz/culture-with-a-side-of- popcorn_b_1439246.html?ref=email_share. Van Derbeken, Jaxon. “Giants Fan Critically Beaten by Dodgers Fans.” San Francisco Chronicle. April 2, 2011. http://www.sfgate.com/cgi-bin/article.cgi?f=/c/a/2011/04/01/BAM31IONA2.DTL. Voisin, Ailene. “Voisen: NBA Must Fix Broken Business Model.” ScrippsNews. July 1, 2011. http://scrippsnews.com/content/voisin-nba-must-fix-broken-business-model. Woolfe, Zachary. “I’m Ready for my Close-up, Mr. Puccini.” New York Times. April 27, 2012. http://www.nytimes.com/2012/04/29/arts/music/the-mets-hd-broadcasts-are-changing-opera.html?_r=3&pagewanted=1&emc=eta1. “The World’s Largest Sporting Venues.” Stadium Atlas. accessed April 25, 2012. http://www.stadiumatlas.com/the-worlds-largest-sporting-venues/.